May 19, 2013 by David Shields. Average Reading Time: about 3 minutes. James Edward Hamilton was born May 19, 1852 in Two Rivers, Wisconsin to Henry Carter and Diantha Smith Hamilton. He established the Hamilton Holly Wood Type Co in 1880, the same year he married Etta Shove, who helped develop the wood type business after their wedding on August 5. Hamilton developed a method for manufacturing wood type that came to been known as the veneer method. Cutting the letter design from a thin piece of Holly Wood with a scroll saw, the letter was cemented to a cheaper backing block, usually pine. This was sanded and polished on the printing side, after which the foot was planed to bring the block down to type-high. This was an efficient innovation in wood type production, allowing Hamilton to sell his Holly Wood types at half the cost of his competition producing in the traditional end cut method1. Hamilton Holly Wood Type Co became Hamilton & Katz in December, 1881 when Maximilian Katz of Milwaukee bought a one-half interest in the company for $1600. The company became Hamilton & Baker in November, 18852 when Mr Katz retired from the company and William B Baker of Springfield, Illinois purchased Katz’s interest. Hamilton & Baker expanded their production capacity when they purchased the Hintze & Baker factory building in Two Rivers on October 15, 1887. Hamilton eventually bought out Baker’s share and on January 1, 1889 the company was renamed The Hamilton Manufacturing Company. The company was to have been named Hamilton, Richards & Luce Company, but was changed at the last moment. 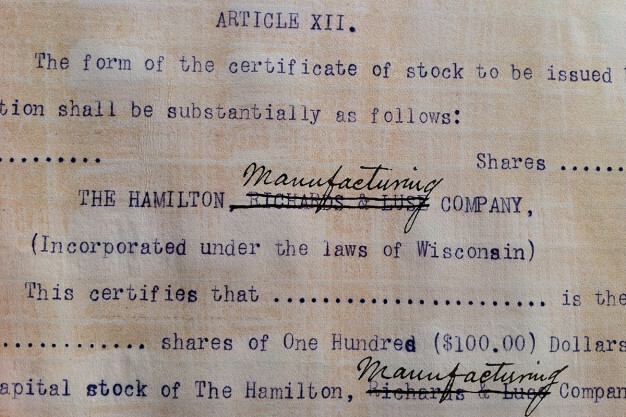 The typed articles of incorporation were changed by hand to read The Hamilton Manufacturing Company. Richards and Luce remained share holders of the new company3. On August 1, 1889 the Chicago Office of The Hamilton Manufacturing Company was opened at 259 Dearborn and moved to 327 & 329 Dearborn Street by May, 1891. It is unclear how long the Chicago Office remained open, though it was listed in Hamilton accounting ledgers until at least 1902. On January 4, 1891 the purchase of Page & Co of Norwich, Connecticut was finalized4. In October, 1891 a New York Office was established, listed at 16, 18, 20 Chambers Street. 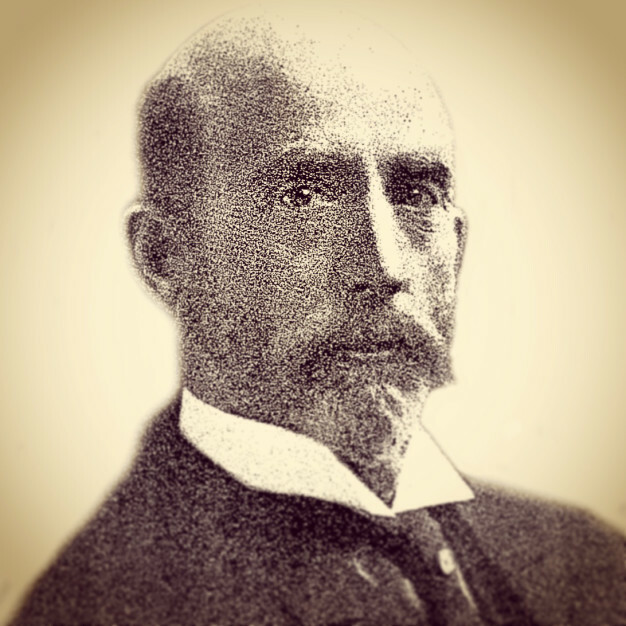 Henry L Bullen5 was hired and placed in charge of the company’s New York Office, handling all orders east of Pittsburg. The New York Office remained active until stock in the Eastern Branch of The Hamilton Mfg Co was sold to ATF in 1893. Through the work of Bullen, The Hamilton Mfg Co entered into a contract with H W Calson & Company of 22–23 Chiswell Street, London on August 28, 1896. The exact nature and full extent of the contract as yet remains unclear. By mid-1909 Hamilton had purchased the four largest wood type companies in the United States6, effectively cornering the market and taking the lion’s share of wood type production in North (and South) America. In late 1919 Hamilton retired from active participation in the company he built from scratch, and in 1928 moved with Etta to Los Angeles. J E passed away in Pasadena, California May 7, 1940. He is laid to rest in the family plot at Pioneer’s Rest Cemetery in Two Rivers, Wisconsin.